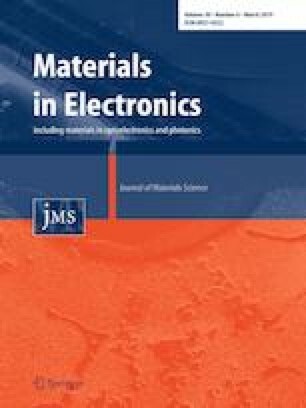 The effect of MgO/CeO2 on the sinterability and microwave dielectric properties of 0.65CaTiO3–0.35SmAlO3 (CTSA) ceramics, synthesized by solid-state reaction method, has been systematic investigated. The results showed that a simple-phase of CTSA ceramics was detected by X-ray diffraction patterns, and both the quality factor and the dielectric constant had similar tendencies with the bulk density. With certain amounts of MgO/CeO2 additives, CTSA ceramics can be sintered at a lower temperature and keep an excellent sinterability and dielectric properties. The optimal combined ceramic was obtained with 0.5 wt% MgO and 0.4 wt% CeO2 at 1360 °C, which exhibited the microwave dielectric properties: εr = 45.21, Q × f = 43140 GHz (5.1 GHz), and τf= − 7.36 ppm/ °C. This work was supported by the Priority Academic Program Development of Jiangsu Higher Education Institutions (PAPD). Jiangsu Collaborative Innovation Center for Advanced Inorganic Function Composites.